Are you old enough to remember the days when the Westwood released the game Dune 2 (one of the first real time strategy war games on the market)? Then a few years later the genre went from cult status to instant classic due to the popular Command and Conquer series. We built up our bases and always included several strategically placed defence towers. 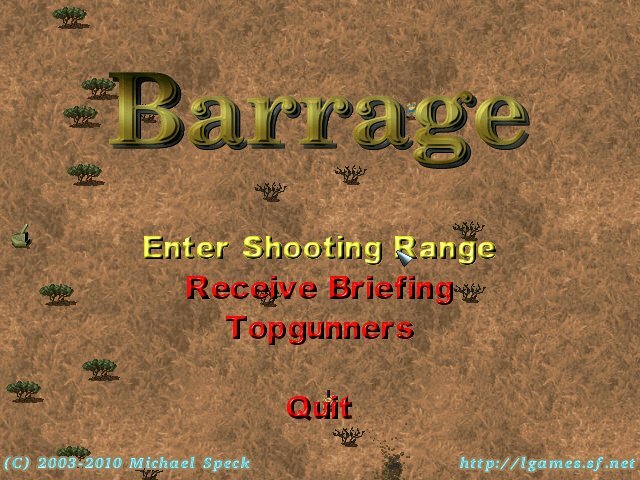 If you ever wanted to know what life was like as a defence tower in the first Command and Conquer game then Barrage is the game for you. The graphics are taken directly from the original of the C&C series games, with the vehicles, tanks and soldiers all members of the GDI (Global Defence Initiative) along with a familiar dessert landscape. They move around smoothly and are accompanied by some nice sound effects of guns firing and bombs exploding, however I feel that background music would have been a nice addition. 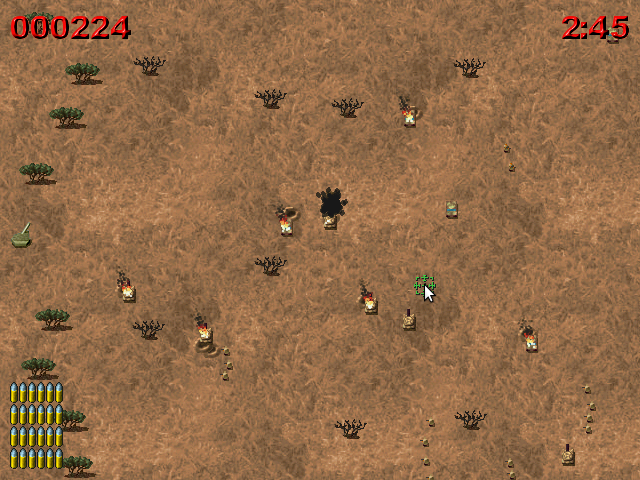 The sprites move vertically up and down the screen, some of the tanks change their pace slightly, but overall they remain mostly at the same speed. 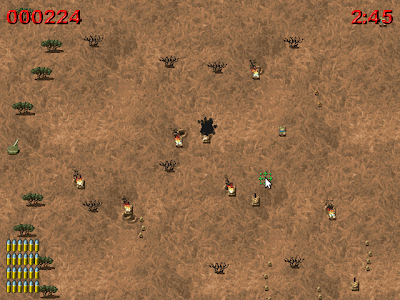 The game is contained within a three minute timeframe: kill as many of the enemy as you can within the allotted time. Any of the enemy units that cross the screen safely will result in points being deducted. 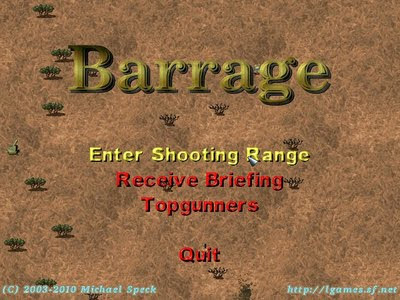 The game is controlled using the mouse; simply move about the screen to target; left click shoots rockets; right click reloads and middle click fire grenades (useful on soldiers only). Although the sprites do not move that quickly, the sheer number of them will have the user requiring quick reflexes and a sharp eye along with a wee bit of anticipation depending on the enemy unit being aimed at. Overall this is fun, but without the ability to move the game soon becomes repetitive. Also there is no way of increasing your allotted time: 3 minutes and that's it. The main reason for returning to the game is to beat your top score. There are no extra missions (as far as I can see) and given this game is dated 2003-2010 then it's probably unlikely they will be added, however I will update the post if this happens. There are some good ideas in here and the game is fun for a few minutes, however it soon becomes repetitive and the lack of progression hurts this games longevity.